This new and updated edition of Brain Quest Canada for Grades 5 and up covers every aspect of Canadian history and culture in 1,000 questions and answers through seven categories. It’s all about Canada, it’s all about learning, and it’s all about fun! UNO has a new best friend, DOS! 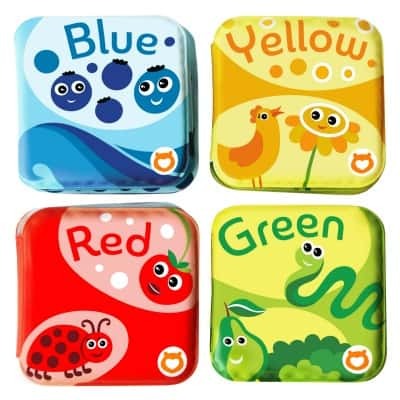 In this fun game, two is more important than one and numbers are king! 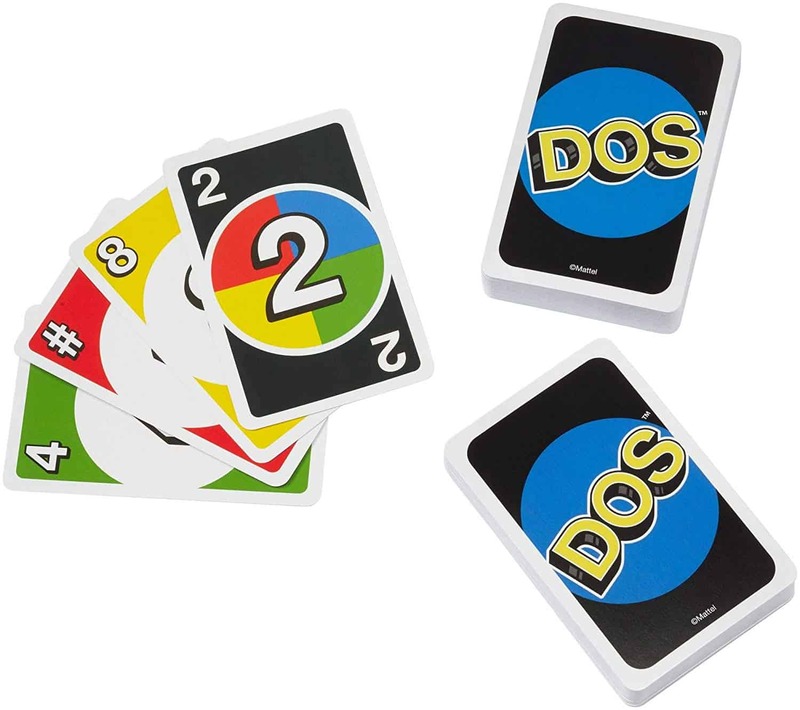 Just like UNO, DOS is a race to get rid of your cards before your competitors do. The first person to 200 points is the winner! “Tiny is Mighty” takes on a whole new meaning with Polly Pocket Pocket World! Choose from three exciting combinations: Sweet Treat featuring micro Polly and Shani dolls Flamingo Foatie featuring micro Polly and Lila dolls Snowball Surprise featuring micro Polly and Shani dolls. Think of it as a mini office kit for when you’re on the go. Pencil sharpener? Check. Scissors? Check. Stapler, staple remover, and staples? Check. Tape dispenser, hole punch? Check. We’ve got you covered for any supply emergency. 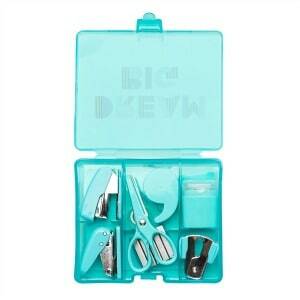 Your dreams have come true because everything is mini-sized to keep you organized! Can you help the Squirrels get ready for winter? 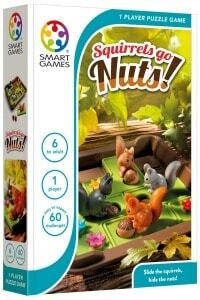 Squirrels Go Nuts is a sliding puzzle with 60 nutty challenges to test your skills. This 3D game board, with bushy-tailed squirrels and autumn leaves and acorns, includes a snap-on lid to easily store everything. Break your Crate Creatures Flingers out of their boxes, pull their tongues and launch them for monstrously fun sounds and interactions. Each Flinger has unique sounds and noises, as well as a light up stomach when you interact with them. Your pilots are trapped in slime. Unbox each pilot and add them to your battle for tag-team or head-to-head competition. Mix and match pilots and Mechbots to create 1000s of customizable Mechbots. 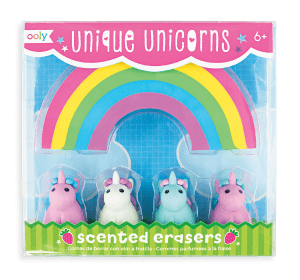 Discover a cuteness overload with Unique Unicorns scented pencil erasers. 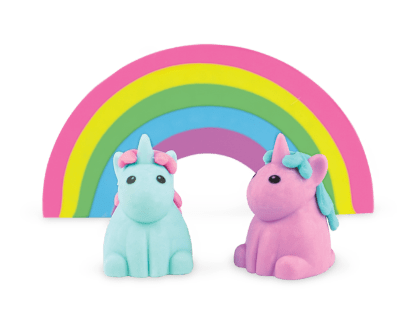 This set of 5 strawberry scented erasers come with 4 colorful unicorns and one really large rainbow eraser. Now you can erase pencil made mistakes with the magical scent of sweet strawberries. 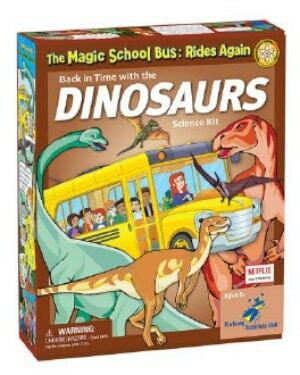 Ms. Frizzle and her students take Young Scientists on a wild ride back in time with the dinosaurs through these marvelous experiments. 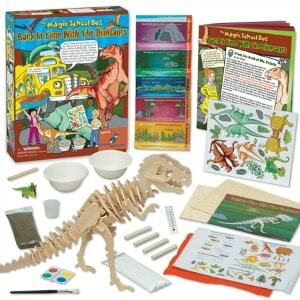 Young Scientists create a timeline, design a diorama, build a wooden dinosaur replica, make cast and mold fossils, mold clay dinosaur teeth, simulate a dino dig, fold 3D dinosaurs, and much, much more! Seatbelts, everyone! Get ready to travel Back in Time with the Dinosaurs! The Herodrive Mash Machines are mash-ups of your favorite DC Super Friends with rescue and urban vehicles! 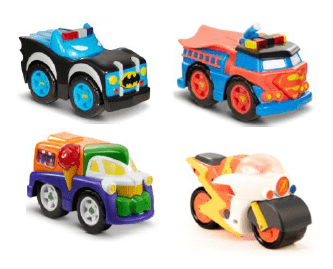 These adorable character cars come equipped with flashing lights and character-appropriate sounds. Push the symbol on the front grill to start the action! 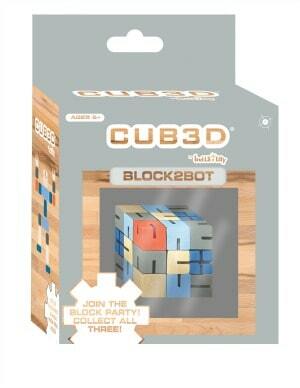 Block2bot is a puzzle cube that will not only tease your brain but transform into a fully-posable robot! collect all 3 Bots and solve them with your friends! twist and lock from block to bot! 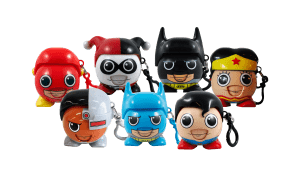 Radz DC Comics dispensers are available in six of the World’s Most Iconic superheroes. Each DC Comics character comes with a 0.7oz pack of Superhero flavored candy, a mini character poster with iconic graphics and a collector’s booklet. 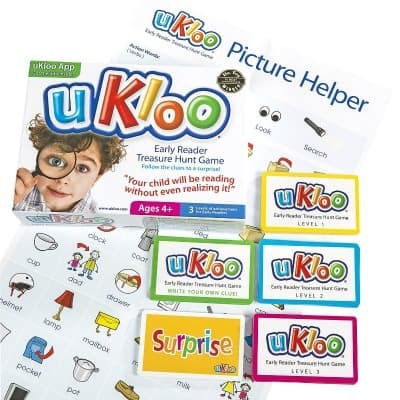 Disguised as a treasure hunt, uKloo Early Reader game gets kids physically active as they read clues and search to find a hidden surprise. There’s even a Picture Helper poster to look up words when kids get stuck. 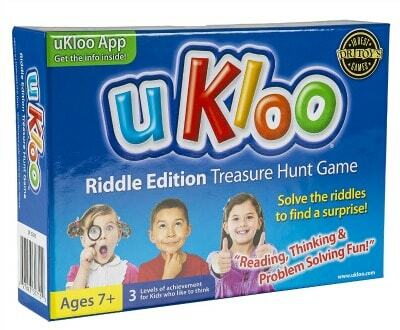 uKloo Riddle Edition Treasure Hunt Game is a stimulating educational adventure. 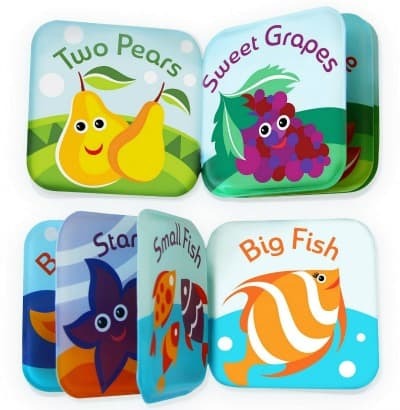 It focuses on boosting reading comprehension and building logic, reasoning, problem-solving, and decision-making skills while promoting independence. 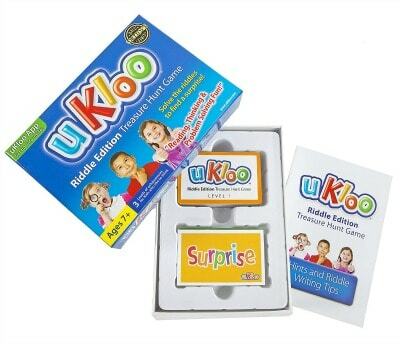 As they move excitedly from clue to clue, kids won’t even realize they’re learning as they read the clues, consult the “Hints Helper” booklet when they need to, and find the surprise at the end. 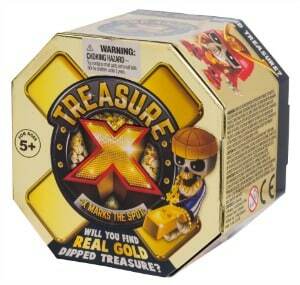 Treasure X is a hunt like no other, search for gold dipped treasure through 10 levels of adventure. Rip, Fizz and Chip away to reveal layers and discover the secrets hidden within. 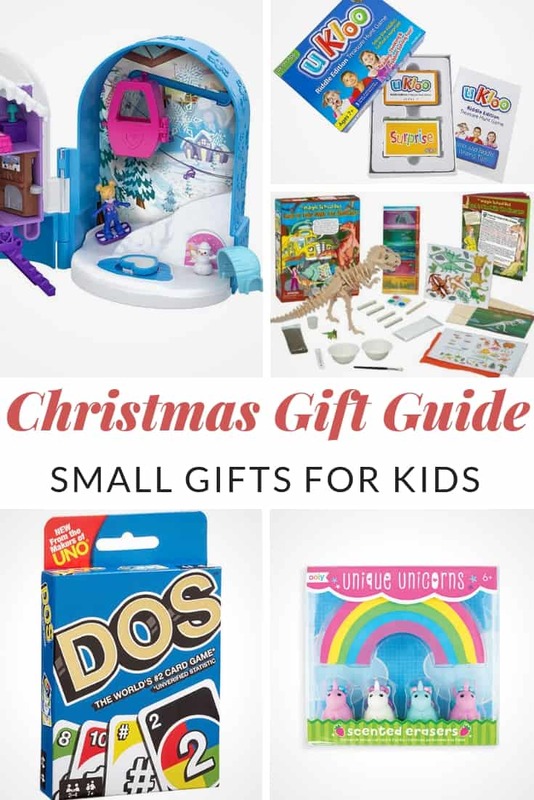 There is even a chance kids could find real gold! Avon Kids Bath & Body are toxin-free so they’re gentle enough for your child’s delicate skin. No parabens, harsh soaps or tears. 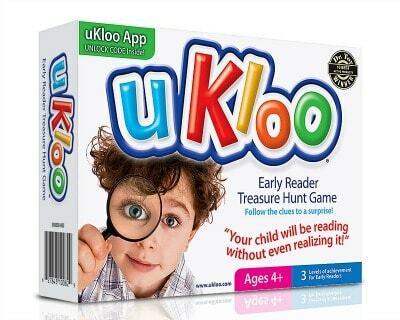 Just 100% good, clean fun! 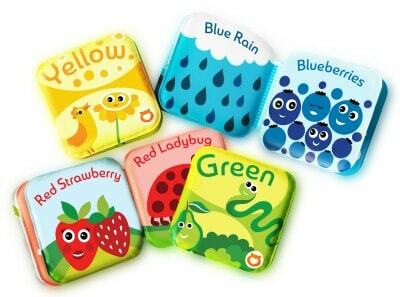 Fun animated characters and objects in the book focus on developing the child’s comprehension of colors and the world around us. They are designed specifically for tiny hands and have a squeaking feature. 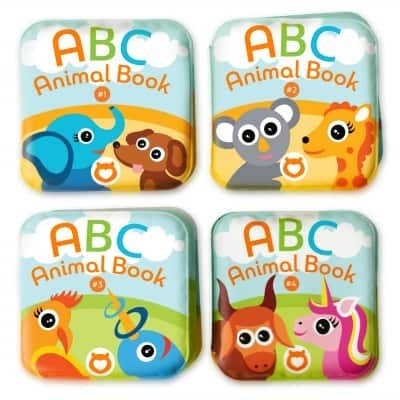 These books feature ABC full alphabet (which is rare for these types of books – most just do A-B-C) Each letter in the book coordinates with a cute image of an animal. They are designed specifically for tiny hands and have a squeaking feature. 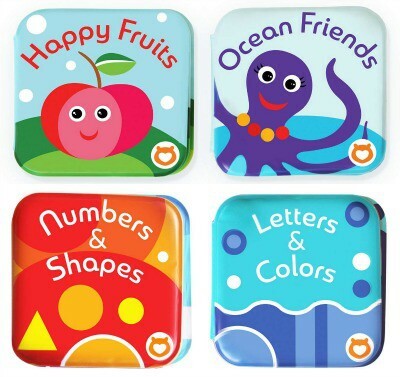 These books combine playful illustrations to stimulate a child’s development while enjoying bath time, numbers and letters. 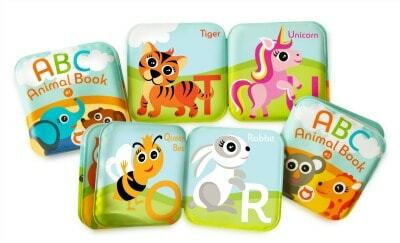 Designed for tiny hands with a squeaking feature these books will definitely be your child’s favorite bath toy. Plush Infant Security Blanket for Boys and Girls with adorable Teddy Bear. 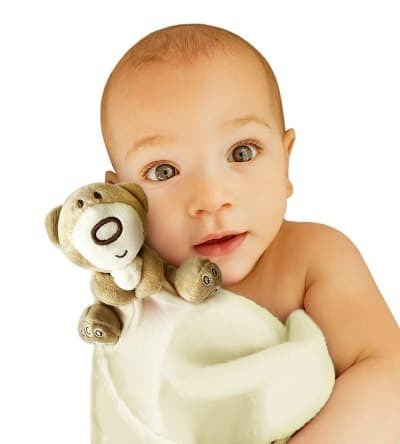 Soothing and Fun, Teddy Bear security blanket will become your baby’s first best friend.